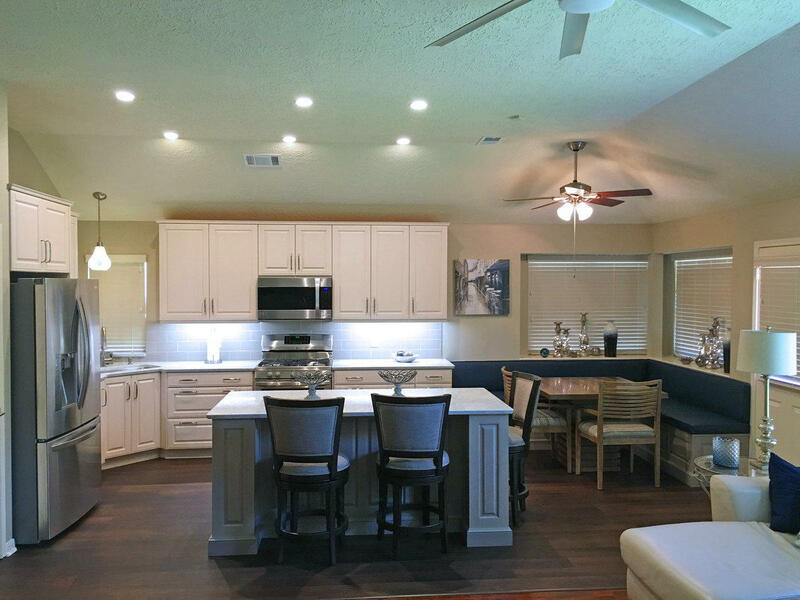 This open concept, transitional kitchen offers lots of seating at the island and the custom banquette. 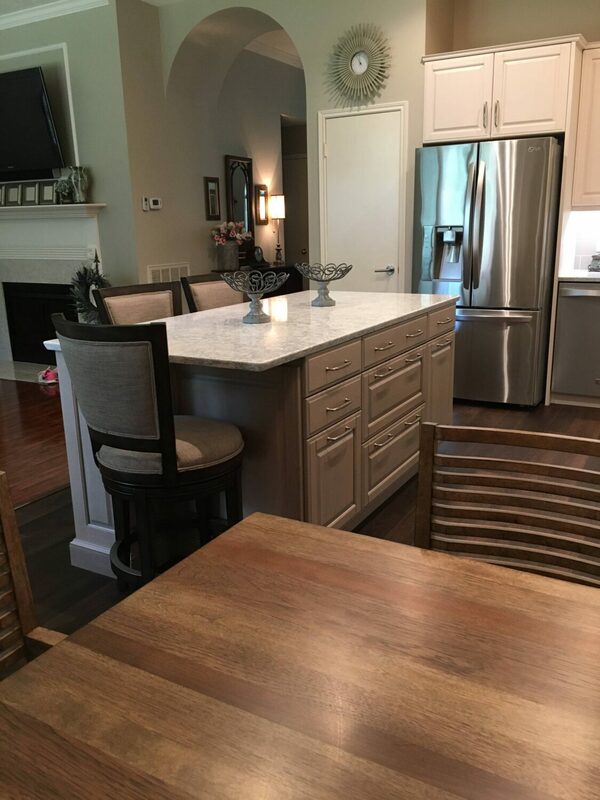 The gray stained island and banquette offer a soft contrast to the white Brookhaven cabinets by Wood-Mode. 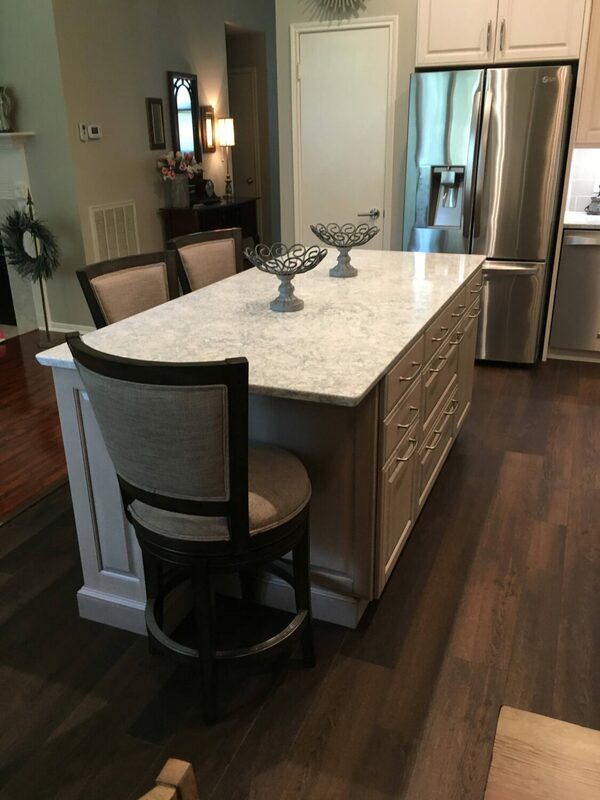 Cambria Montgomery countertops introduce subtle soft blue, white and gray tones. 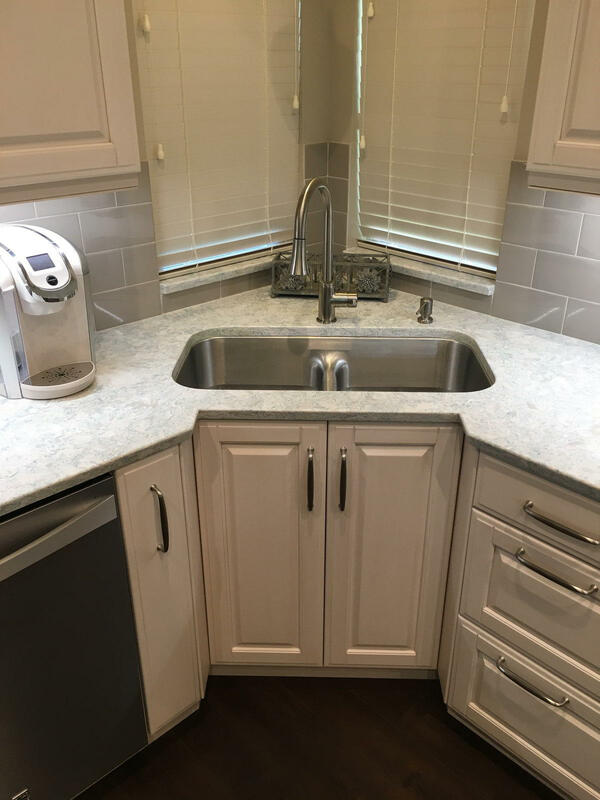 The corner sink is set in a recessed front cabinet and has a low center divider to allow soaking of large pans and grates when needed. 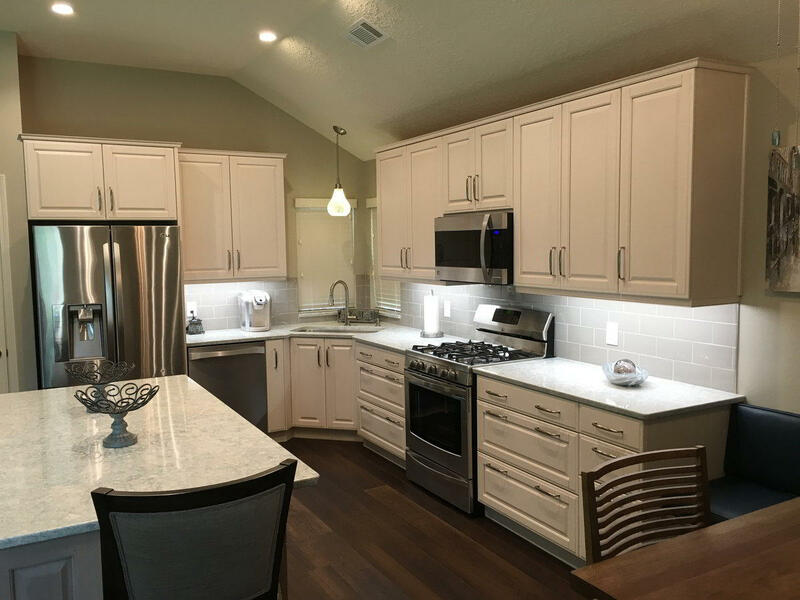 Transitional Kitchen in Friendship TX The Cambria Montgomery quartz countertops offers subtle whispers of soft blues and grays in a white background, atop white cabinets and a gray island & banquette. 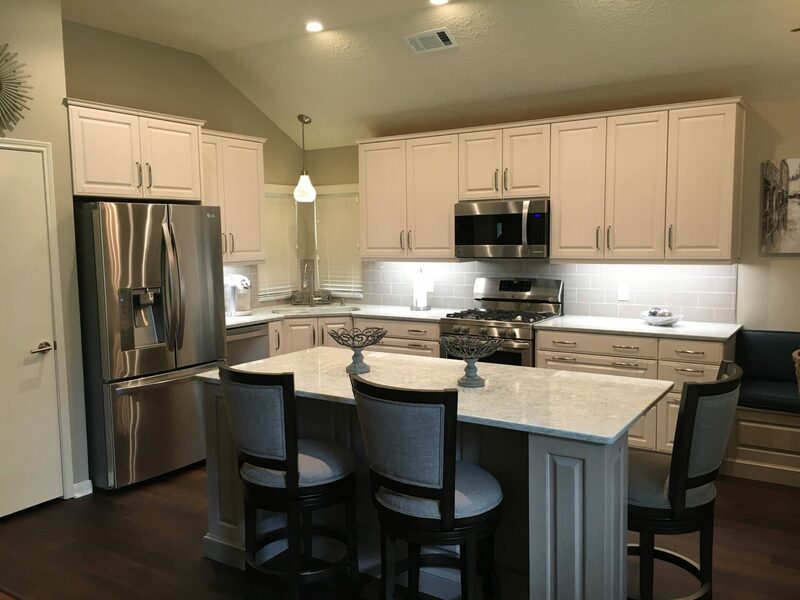 Open Concept Kitchen Design in Friendship TX The Cambria Montgomery quartz countertops offers subtle whispers of soft blues and grays in a white background, atop white cabinets and a gray island & banquette. The corner sink cabinet is recessed for improved ergonomics. LED recessed cans and under-cabinet lighting brighten the space even more. The Cambria Montgomery quartz countertops offers subtle whispers of soft blues and grays in a white background, atop white cabinets and a gray island. The corner sink cabinet is recessed for excellent ergonomics. Lots of drawers maximize storage space and accessibility. 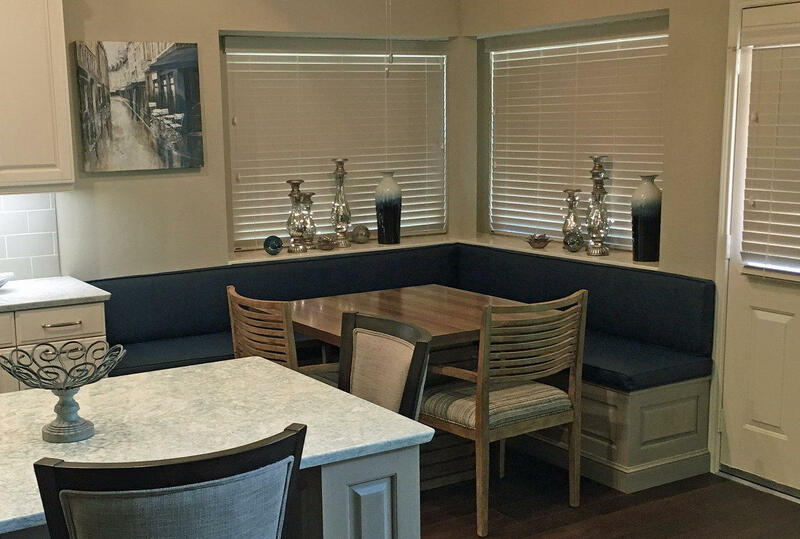 This custom banquette offers comfortable, convenient, attractive kitchen seating with custom blue leather cushions that bring out the blues in the Montgomery countertops. The Cambria Montgomery quartz countertops offers subtle whispers of soft blues and grays in a white background, atop white cabinets and a gray island. The Cambria Montgomery quartz countertops offers subtle whispers of soft blues and grays in a white background, atop a gray stained island. Abundant drawer storage space and island seating. 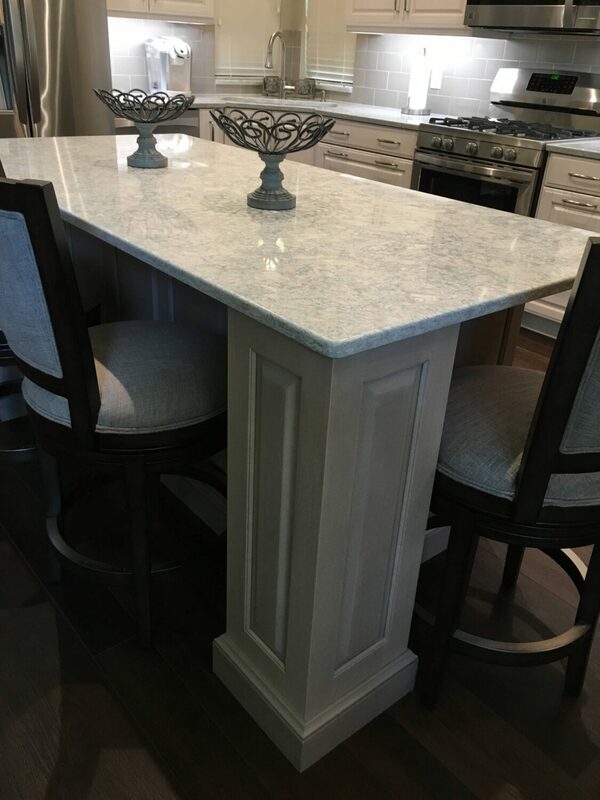 The Cambria Montgomery quartz countertops offers subtle whispers of soft blues and grays in a white background, atop a gray stained island. 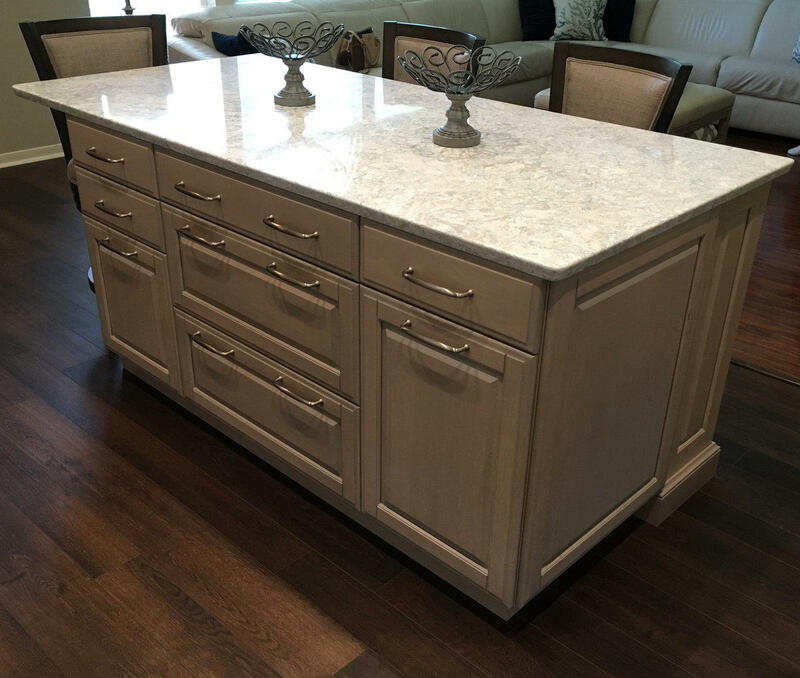 A double trash / recycle cabinet is integrated into abundant drawer storage space and island seating. This special recessed corner cabinet provides more comfortable use of the corner sink. 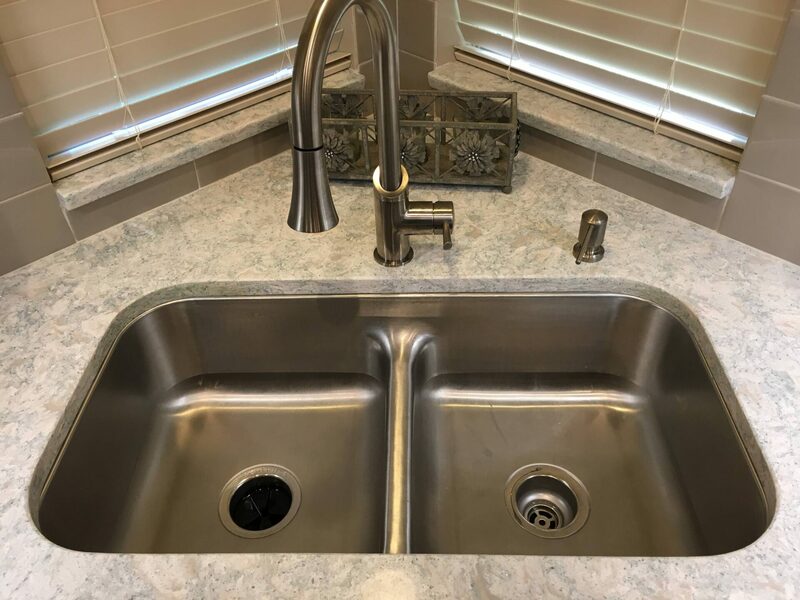 The innovative low-divide sink provides two bowls while also offering the ability to soak large pans and even grill grates! This low-divide sink is the perfect solution to soaking larger roasting pans, oven grates and other large items. The Cambria Montgomery quartz countertops offers subtle whispers of soft blues and grays in a white background.